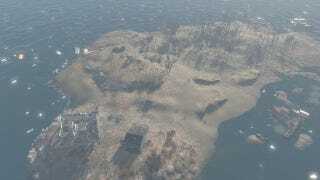 If you haven’t yet unlocked Spectacle Island in Fallout 4, I would like to caution you first! I’m not sure if my Xbone has glitched or not, but once the sonic beacon radio tower was activated, the Mirelurks became friendly. Like, I could shoot the crap out of them and they would not attack. They’re almost like...pets...now. He didn’t move either when I appeared next to him, just kept plugging away.